What’s it like playing for 50,000 people? Over the years I’ve performed to an audience of none (some of my Performance Art and Experimental Music performances took place in very odd settings) up to audiences of tens of thousands (stadium concerts) and while I’m tempted to say each performing situation is different, really, it’s not. I mean, in the end, you just get up on the stage and do your thing, whatever that may be, right? A couple weeks ago I was talking to a student about performing at stadium shows, mentioning “playing for 50,000 people,” and I recalled that I had a post draft from March (12) of 2014 where I referenced that number. The quoted section above was what I had saved and interestingly, I’ve changed my mind about the “and while I’m tempted to say each performing situation is different, really, it’s not” comment. The “Main Stage” at Gen Con in Indianapolis, Indiana. 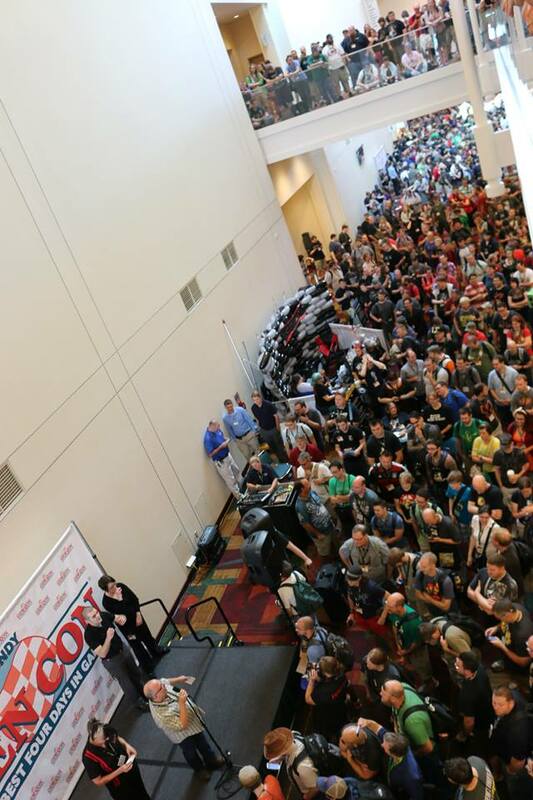 In 2014, Gen Con had a record breaking unique audience count of 56,000 with a 184,000 turnstyle count. The 50,000 figure, as I recall, had to do with the attendance at Gen Con 2013 (this is for unique attendees, not turnstyle count which was closer to 200,000) and not necessarily an audience figure for a show I’ve played. 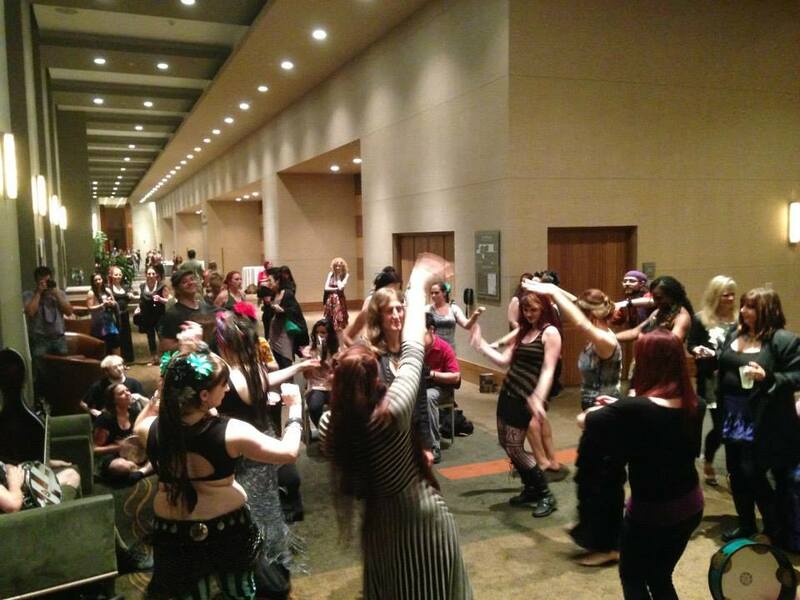 The Gen Con “main stage” where I’ve often played with il Troubadore, which is outside the dealers’ hall, invariably has thousands of people passing by in any given hour. The biggest show I can recall playing was in Houston at the Sam Houston Race Park. 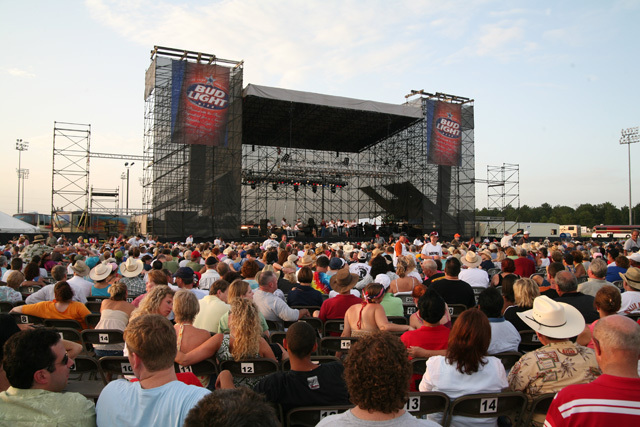 It was the third of three shows during the Willie Nelson 4th of July Picnic in 2008. 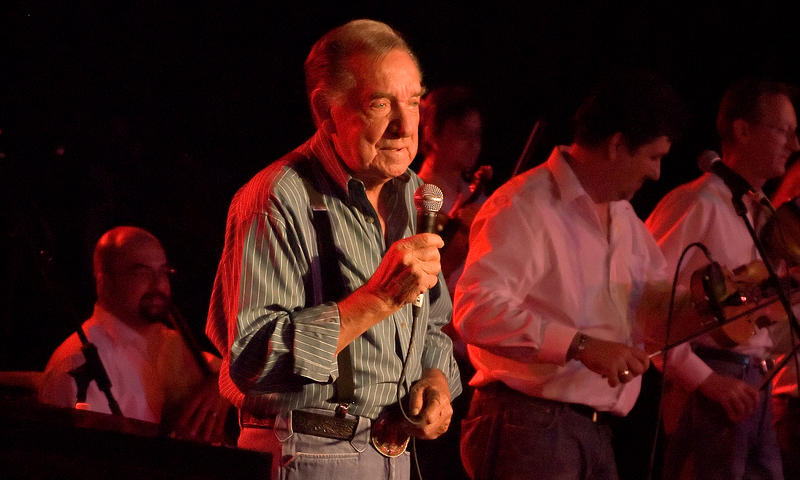 Started in 1973, the festival was often a multi-day event during the holiday weekend.At the time I was touring with multi-Grammy Award winner, and Country Music legend, Ray Price. We, along with Merle Haggard, and Willie Nelson were the headlining acts for the event. It was a weekend of packed shows starting with a performance (July 3) at Willie’s Place truck stop in Carl’s Corner, Texas. As I understand it, that was the opening of the venue which was recently bought by Willie Nelson. The 1000 square ft dance floor was standing room only and while it was a good medium sized venue, it probably only held about 800–maybe a thousand (and as closely packed as everyone was, the latter wouldn’t surprise me). On July 4th, we were at the Verizon Amphitheatre in Selma (outside San Antonio), Texas. The capacity of that venue is 20,000 and by the time we, Merle Haggard, and Willie Nelson went on, the venue was packed. The biggest show of the three would have been at the Sam Houston Race Park the next day (July 5). Interestingly, the SHRP hit its attendance high the previous day (32,177). Of course, that was a figure for the stands for the Horse Racing. The stage for the concert was in the center of the track, where most of the concert audience was located (see top image of the audience view from the stage). The audience filtered out into the stands as well, but I have no idea what the total attendance figure was. Presumably less than 60,000 since the record high attendance figure for the event is from 1976 at 80,000. During the three years I toured intermittently with Ray Price, I’ve played a number of stadium/amphitheater/festival shows. With other bands and acts I’ve played with, I’ve also done a number of similar big outdoor events. While most of these only numbered in the thousands (rather than the tens of thousands) they’re really all functionally the same from a performer’s and audience member’s standpoint. And going back to the busking discussion and my changing opinion, what’s the same is that it doesn’t matter much which genre of music is being played at a festival or on a street corner–that part is all the same across genres, what’s different is the performance context. 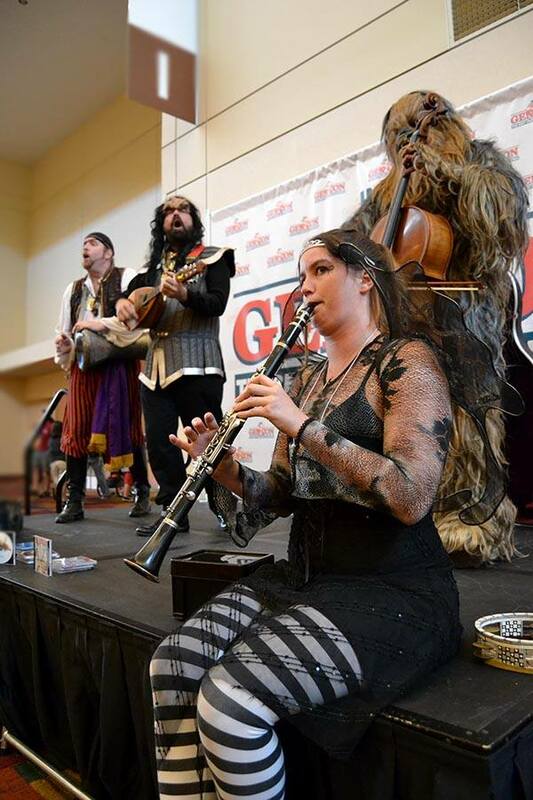 Whether I’m busking as a Klingon cellist as part of the roving entertainment at Gen Con, or as a drummer with an Arabic group at a Farmer’s Market, or as a strolling musician at an Italian Festival, or just out on the street corner downtown in a large city–that’s all the same. You’ll learn to have conversations while playing (if that’s possible–wind players obviously can’t) and you’ll often stop playing and just directly interact with people intermittently throughout the “performance.” You’ll learn that you can easily repeat repertoire because very few people will be hearing more than one minute much less one song. 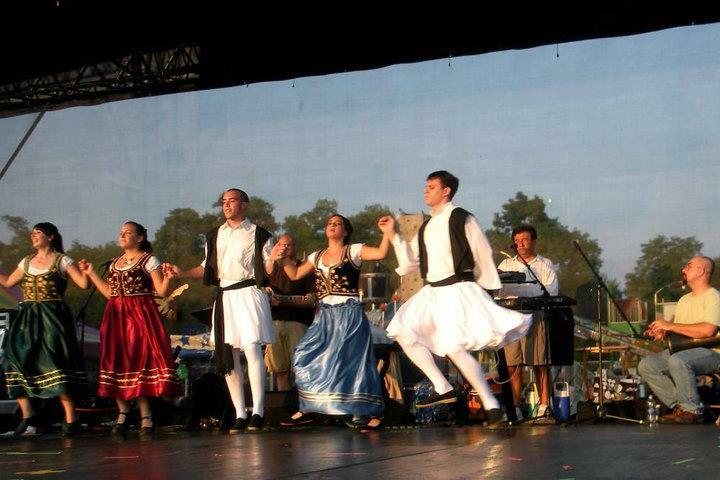 Playing at a big festival is completely on the opposite side of the spectrum in most ways–and that doesn’t matter if it’s a rock concert, outdoor classical pops concert, or Greek Festival–you’ll rarely get to interact directly to audience members. You likely won’t repeat tunes and have a set list or program completely mapped out. Your time on stage is restricted to a certain length. In other words, so much more is mapped out here as opposed to busking. Now, get a bunch of bluegrass, folk musicians, or world musicians together for a festival or event, and most bets are off as we find any excuse to play with and for each other–often throughout the wee hours of the night! I’ve yet to find anything like this phenomenon happening regularly amongst Classical or Pop/Rock musicians, but then again I’m always saying the musical world is so much bigger than the simplistic Pop-vs-Classical divide we’re constantly given by crisis folks, right? Interesting and informative, thank you!